Ready to buy? Select a button below to view Pure Metallic in our webstore. What is a Pure Metallic Epoxy Floor Kit? 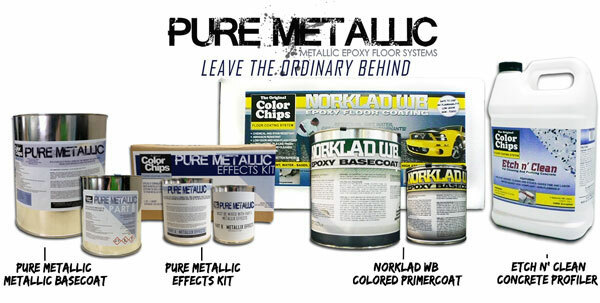 Pure Metallic floor kits are a 100% solids, two component epoxy. It is a special formulated epoxy with a pearlescent metallic pigment. It is roller or squeegee applied to your floor. This coating requires a primer coat, metallic 100% solids epoxy base coat, an optional clear coat. The finished look is a smooth, glass like finish that has a unique and subtle reflective sparkle. No two floors will ever look the same. There are endless creative techniques that can be used to create a style that you can call your own. Some of our customers say the Metallic floors resemble moon craters, a lava lamp, lighting strikes, marble countertops, shimmery glitter paint and they appear three dimensional.